President Donald Trump digs coal, apparently more than he likes clean air or a healthy climate. And, as a recent document leaked by his administration indicates, he also favors coal industry profits over a free market. Last month, Bloomberg published a draft Department of Energy directive that would employ Cold War-era laws to force utilities to purchase enough power from coal and nuclear power plants over the next two years to keep them running, thereby throwing a lifeline to the drowning industries. This is a repeat of Trump and Energy Secretary Rick Perry’s attempt last year to make the Federal Energy Regulatory Commission give preference to coal and nuclear. FERC refused, saying that there was no evidence to suggest that any past or imminent power plant retirements would affect grid resilience. A study by Perry’s own department reached a similar conclusion. Trump’s new directive, which has been endorsed by Perry, appears to provide a way around the Energy Department’s own regulatory body. The draft document argues that the government must step in and prop up coal and nuclear because the rash of plant retirements threatens the reliability and resilience of the electrical grid, and that, in turn, is a threat to national security, to the economy, and — ironically enough — the environment. The document provides a case study in logical contortionism, a tortured attempt to rationalize irrational meddling with markets. 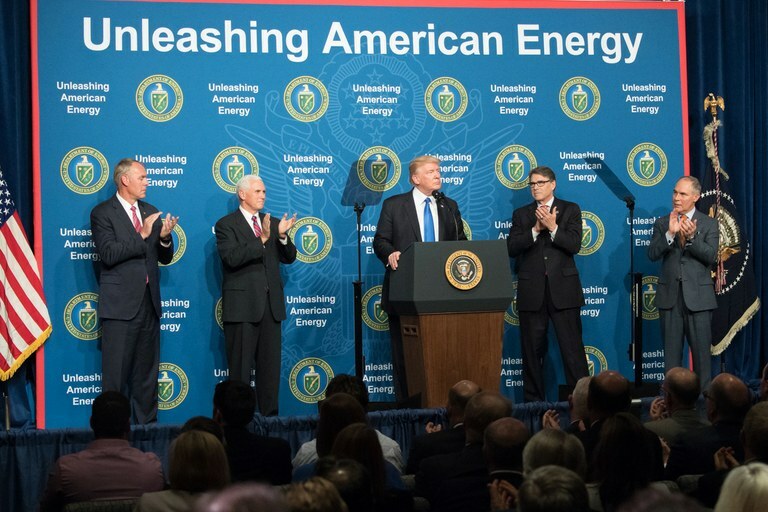 President Donald J. Trump promotes the White House’s “Energy Week” at the Department of Energy last June. Over the last half decade, a glut of cheap natural gas and burgeoning wind and solar power-generating capacity have driven wholesale electricity prices down, nudging nuclear and coal power plants into the red and forcing dozens of them to shut down altogether. The result has been an overall decrease in the electricity sector’s greenhouse gas emissions and other pollutants. Yet according to Trump’s directive, the mass shutdown has also meant a loss of “fuel assurance,” or the ability of power plants to stockpile extra fuel on-site so that they can continue to crank out the juice if supply lines are disrupted. Coal and nuclear plants have fuel assurance. Natural gas plants, not so much. If the pipelines feeding a plant are blown up or shut down by a terrorist attack, they typically have little to no on-site backup. So an electrical grid that relies too heavily on natural gas is going to be at the mercy of the pipeline network. According to Perry’s directive, that leaves the nation vulnerable to mass blackouts. What the directive fails to grasp, however, is that when it comes to the grid’s reliability and resilience, fuel assurance is relatively insignificant. Most outages are the result of problems within the intricate electrical transmission or distribution systems: Extreme heat can cause power lines to sag and rub against tree branches, wildfires can take out power poles, squirrels and birds commonly get caught up in substation apparatus, and sudden spikes in demand can wreak havoc on the grid. Only rarely do power-plant shutdowns result in major outages, and fuel supply is almost never the cause. In October, the independent research firm Rhodium Group found that “fuel supply issues were responsible for 0.00007 percent of lost customer electric service hours” between 2012 and 2016. Furthermore, replacing large, centralized coal and nuclear plants with smaller, more nimble and more distributed wind, solar and natural gas plants diversifies the grid, contrary to what the directive claims, thus making it less vulnerable to catastrophic outages. Bizarrely, the directive contends that it will result in less pollution by reducing the number of blackouts, thereby decreasing the use of dirty backup diesel generators. The logic behind this is so twisted it needs no response. That said, nuclear power generation is carbon-free, while natural gas — though cleaner than coal — is not. So keeping existing nuclear plants running could theoretically result in reduced greenhouse gas emissions (though the directive never once mentions climate, carbon or greenhouse gases). Yet this ignores the thousands of tons of excess greenhouse gases and other pollutants coal power plants will emit as a result of the directive. Assuming the order moves beyond draft form, it likely will face a rash of legal challenges and protests. While the nuclear and coal industries like it, almost no one else does, including grid operators, utilities and even the American Petroleum Institute. If Perry really wanted to diversify the grid and enhance reliability and resilience, he’d be putting federal dollars and energy toward developing power storage technology, both centralized and distributed, to give solar and wind a sort of fuel assurance of their own. He’d be pushing energy efficiency, rooftop solar and demand response — shifting customers’ electricity use away from times of peak demand. The draft directive seems primarily aimed at helping the coal industry, with nuclear thrown in — perhaps because the fuel-assurance argument used to back up coal also applies to nuclear. But Perry’s not really interested in any of that. He’s merely interested in creating the illusion that he and his boss are doing something to save that American icon, the coal miner. And most of all, he’s cynically using reliability and national security claims to help out Trump’s big-dollar, fossil fuel industry donors, for whom this directive seems tailor-made.